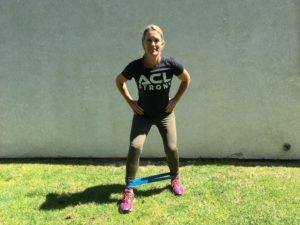 In this post, I’ve put together 3 exercises showing 3 different pillars of training that will help to strengthen your legs and protect your knees from injury. The best part is that this will only take you a few minutes to do. The general term for the type of exercise that I’m about to reveal is called “neuromuscular reeducation training.” Before you get overwhelmed by that phrase, make it easier on yourself and call it “neuro re-ed.” There, now you sound like an expert! During our “neuro re-ed” training, we are focusing on good quality technique and learning new movement patterns to strengthen your muscles and keep your knees safe. Begin by standing on one foot. Bend your knee slightly, so it is not locked all the way straight. As you put all of your weight through one foot, I want you to THINK and FEEL where your weight is being distributed. Try to place equal weight through your big toe and pinky toe. Then, add equal weight onto your heel, so you have three primary points of contact. Imagine a tripod, with those three points of contact, and feel yourself form an arch through the bottom of your foot. Your ankle may wobble inward and outward as you try to maintain your balance. Focus on your knee pointing straight forward (not inward or outward) and maintaining the arch in your foot. Hold this position for 30 to 60 seconds on each foot. If you want to challenge yourself a bit more, try turning your head slowly to look side to side. If that still isn’t hard enough, try reaching down to touch the floor and return back to standing. At all times, keep your knee pointed forward, centered directly over your foot. The second exercise comes from the strength pillar, another essential component of injury prevention training. Again, good form can take an exercise from detrimental to hugely beneficial. 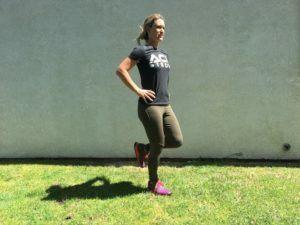 Begin by placing a resistance mini band around your ankles and separate your feet to shoulder-width apart so there is mild tension in the band. Now, to add some variation, place your right foot about 6 inches forward so the feet are in a staggered stance. Sit your hips back slightly so there is a slight bend in the knees, and make sure the knees are centered directly over your feet (not inward toward each other). Step to the right with your right foot, so there is more tension through the mini band. Then follow with the left foot, keeping the staggered forward-back position. Continue sidestepping 10-15 steps to the right, then return to the left. Keep your upper body steady, so you aren’t leaning side to side as you step. You may alternate which foot is in front and repeat the staggered sidestepping exercise. The third exercise targets landing mechanics, which is yet another pillar of neuro re-ed and injury prevention training. Whether you are stepping down stairs or landing from a header in soccer, you need to know how to land correctly. 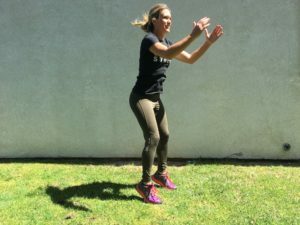 You can make this exercise low-impact or high-impact, depending on what your sport or activity is and what you can tolerate. Begin by standing with your feet shoulder-width apart. Assume the tripod position on both feet. 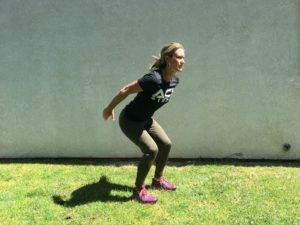 Lower your hips back and down slightly, as you lower down into a squat. You are going to swing your arms when you go into a small vertical hop, so bring your arms back to get ready. Next, swing your arms forward and hop off your toes into the air. When you return to the floor, land softly on the balls of your feet first, and immediately lower your hips back down into a squat, for good shock-absorption. Repeat the hop again, making sure you are landing softly and quietly on both feet equally. Your knees should bend as you land, but remain directly over your feet. Keep your knees equi-distant apart throughout the movement; and don’t let them move closer together or farther apart. Repeat 10-20 soft hop-landings as tolerated. To vary the intensity, you may choose to hop higher in the air or to not hop at all. If you prefer a low-impact option, simply follow the above description, but only rise up onto your toes, without leaving the ground, then lower back down. It is not necessary to squat real low or deep in this exercise. Also, join our new Facebook group, Thriving Athletes Without Injuries, for more education, information, and ideas about preventing sports injuries and helping your athletes thrive on the field and in life.